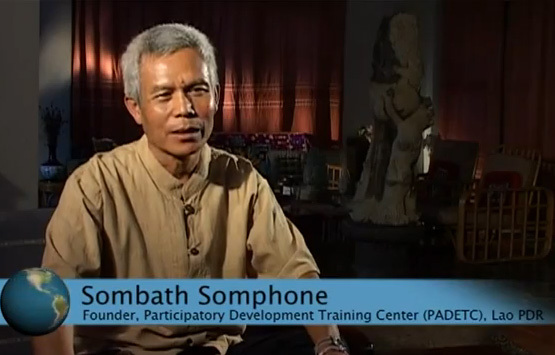 Sombath Somphone worked for 30 years to promote sustainable development through training and educating young people in Lao PDR. In 1996, he founded Participatory Development Training Center (PADETC), which he headed until mid 2012. In 2005, he received the Ramon Magsaysay Award (Asia’s Nobel Prize) in recognition of his efforts to promote sustainable development in Laos “by training and motivating its young people to become a generation of leaders”. This video is edited from an interview TVE Asia Pacific filmed with Sombath in September 2008 for the Saving the Planet Asian regional TV series. Excerpts appeared in the Lao story that featured PADETC’s efforts to transform Lao education. He outlines his vision for inclusive and sustainable development, and how digital technologies can be used to spread knowledge and education among youth, enabling them to create their own media to tell their own stories.